‘Strong’ Catholic Identity at a Four-Decade Low in U.S. The decline among U.S. Catholics is even starker when they are compared with Protestants, whose strength of religious identification has been rising in recent years. About half (54%) of American Protestants – double the Catholic share (27%) – described their particular religious identity as strong last year, among the highest levels since the GSS began asking the question in 1974. Strength of religious identity is associated in the GSS with higher levels of religious commitment, such as more frequent attendance at worship services. In general, “strong” Catholics report going to Mass more often than do Catholics as a whole, and “strong” Protestants say they attend church more often than do Protestants overall. However, over the past four decades, self-reported church attendance has declined among “strong” Catholics as well as among Catholics overall. The share of all Catholics who say they attend Mass at least once a week has dropped from 47% in 1974 to 24% in 2012; among “strong” Catholics, it has fallen more than 30 points, from 85% in 1974 to 53% last year. Among Protestants as a whole, self-reported church attendance has been fairly stable, although the share of those who attend at least once a week was somewhat higher in 2012 (38%) than in 1974 (29%). Self-reported church attendance among “strong” Protestants has fluctuated over the years, but the share of frequent attenders was not significantly different in 2012 (60%) than in 1974 (55%). In 1974, Catholics were more likely than Protestants to report attending religious services at least once a week (47% vs. 29%). By 2012, the situation had reversed: Protestants overall were more likely than Catholics to say they attend church weekly or more often (38% vs. 24%). 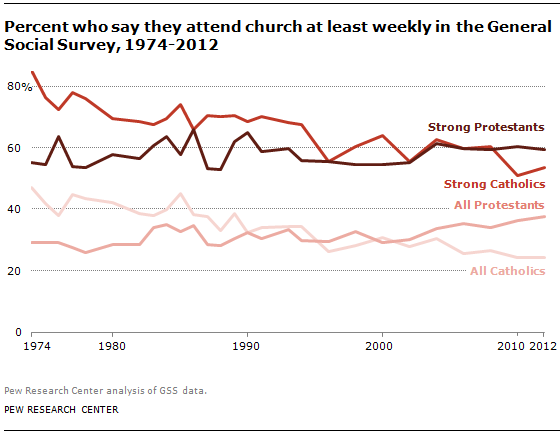 Similarly, in 1974 “strong” Catholics reported going to church more frequently than did “strong” Protestants (85% vs. 55%), but in recent years “strong” Protestants have reported attending church about as often as “strong” Catholics do (60% vs. 53% in 2012). 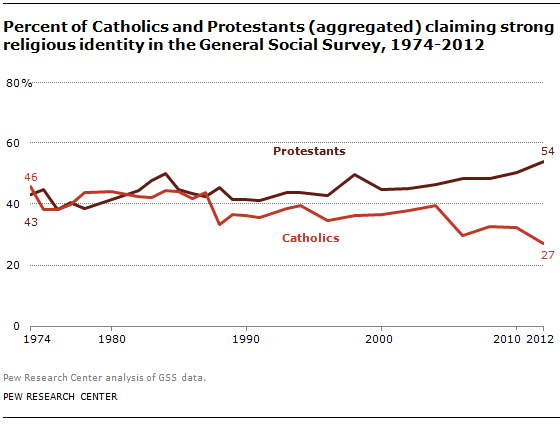 From 1974 until the late 1980s, U.S. Catholics were roughly comparable to Protestants on the question of the strength of their religious identity. 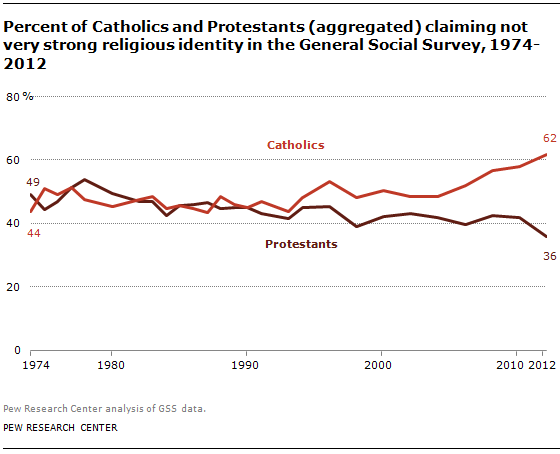 Since the mid-1990s, however, Protestants have consistently had higher strength of religious identity than Catholics, and the gap has widened in recent years. In addition, the percentage of U.S. Catholics who say they are “not very strong” Catholics has been increasing, while the percentage of Protestants who say they are “not very strong” members of their denomination has declined over time. In 1990, 45% of both Catholics and Protestants said they were “not very strong” members of their faith. 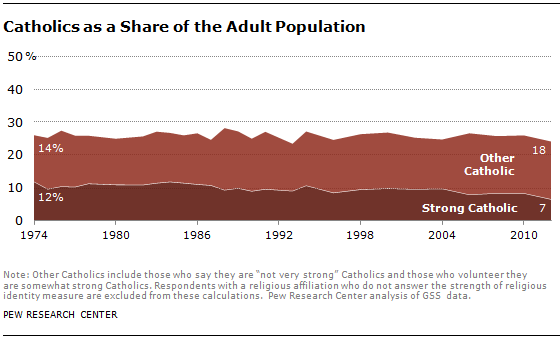 By 2012, the share of “not very strong” U.S. Catholics had increased to 62%, while the share of “not very strong” Protestants had dropped to 36%. Within the overall Protestant category, respondents can be separated into three major religious traditions: black Protestants, mainline Protestants and evangelical Protestants. For example, members of the Southern Baptist Church and the Assemblies of God belong to the evangelical Protestant tradition, while members of the United Methodist Church and the Presbyterian Church (USA) are part of the mainline Protestant tradition, and members of the National Baptist Convention and the Church of God in Christ are in the black Protestant tradition. Of these major religious traditions, black Protestants and evangelical Protestants were most likely to report having a strong religious identity in 2012. 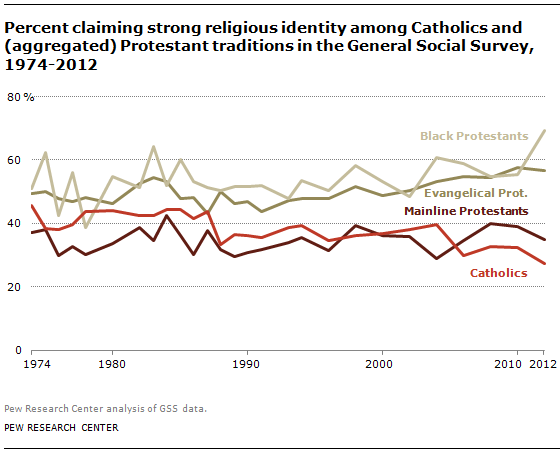 Mainline Protestants are the least likely of the three Protestant traditions to report a strong identity with their faith. In 2012, 69% of black Protestants affirmed a strong religious identity, as did 57% of evangelical Protestants, 35% of mainline Protestants and 27% of Catholics. 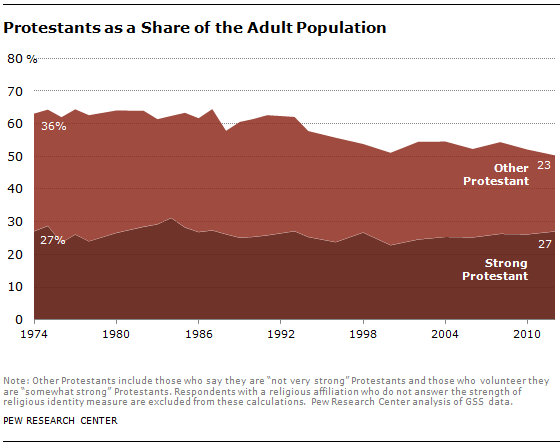 Over the same period, however, the share of the population that identifies as Protestant but not “strong” Protestant declined substantially, from 36% in 1974 to 23% in 2012.4 In other words, the increasing concentration of “strong” Protestants seems to be due, in part, to attrition in the ranks of Protestants who do not claim a strong religious identity. The General Social Survey is a project of the independent research organization NORC at the University of Chicago, with principal funding from the National Science Foundation. All results are produced using a composite weight that is the product of three weight variables included in the 1972 to 2012 GSS cumulative dataset: WTSSALL (which adjusts for the number of adults in the household), OVERSAMP (which adjusts for oversamples of African Americans in 1982 and 1987), and FORMWT (which adjusts for problems with the randomization of various questionnaire forms in the 1978-1985 waves of the GSS). Respondents with a religious affiliation who did not answer the religious strength measure are excluded from the analysis of religious strength. This amounted to less than 1% of the people who took the survey in 2012, but it was higher in some other years. See Smith, Tom W. July 1993. “Little Things Matter: A Sampler of How Differences in Questionnaire Format Can Affect Survey Responses.” National Opinion Research Center, University of Chicago, GSS Methodological Report No. 78 (PDF). The coding of denominational affiliations into Protestant religious traditions uses RELTRAD syntax for Stata (PDF). See Steensland, Brian, Jerry Z. Park, Mark D. Regnerus, Lynn D. Robinson, W. Bradford Wilcox, and Robert D. Woodberry. 2000. “The Measure of American Religion: Toward Improving the State of the Art.” Social Forces, volume 79, issue 1, pages 291-318. This approach to classifying Protestants into mainline Protestant, evangelical Protestant and black Protestant traditions has been widely used by social scientists in the analysis of GSS religion data. Among respondents who identify as some type of Protestant or only as Christian in the GSS RELIG variable, 94% are classified into a religious tradition by this syntax.